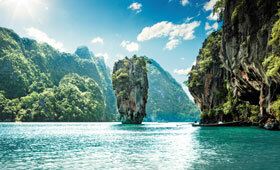 Star Clipper explores the sun-kissed islands of Thailand and Malaysia, as well as cosmopolitan Singapore on this unique voyage under full sail. This exciting itinerary visits the Similan archipelago, considered one of the best diving locations in the world and Phang Nga Bay with its magnificent limestone karsts rising from the emerald waters, before heading to Malaysia. Explore Penang, known as the Pearl of the Orient and Malacca, a World Heritage Site which once the centre of the Malay world, before this fascinating holiday concludes in diverse Singapore. The Similian archipelago is considered one of the best diving locations in the world. See the striking boulders on the beaches and keep an eye out for wildlife including crab-eating monkeys and lizards. Please note: Passengers on 16 Nov 2019 and 15 Feb; 28 Mar 2020 departures will visit Ko Miang today. In addition, on all reverse departure dates, passengers will visit Ko Similan or Ko Miang. The island of Penang was part of the Malay sultanate until 1786. Highlights include the Reclining Buddha and the streets of Georgetown, lined with historical buildings, including 19th-century merchant houses. The reverse itinerary visits Langkawi instead of Penang. Relax on board Star Clipper as you head to Malacca. Malacca was the centre of the Malay world in the 15th and 16th centuries. Today it is a World Heritage Site, home to the ruined Portuguese fort "A Famosa" and St Paul's Church which overlooks the Malacca Strait and Dutch Square. Disembark Star Clipper in Singapore. The Captain reserves the right to alter the itinerary to suit wind and weather conditions. PLEASE NOTE: The reverse itinerary visits Langkawi instead of Penang. In addition, the 21 Dec 2019 departure is an 8-night cruise which visits Ko Rok Nok before heading to Ko Adang. €600 on board credit OR no single supplement on 21 Dec 2019 departure! PLEASE NOTE: The reverse itinerary visits Langkawi instead of Penang. In addition, the 21 Dec 2019 departure is an 8-night cruise which visits Ko Rok Nok before heading to Ko Adang.